Open a drawing containing some geometry, or start a new drawing and create some. Turn off running object snap mode by clicking the OSNAP button on the status bar until the button appears to be dimmed and <Osnap off> appears in the command line. Although you can use object snap overrides while running object snaps are enabled, it is recommended that you turn off running object snaps while you’re becoming familiar with object snap overrides. After you get the hang of each feature separately, you can use them together. Start the Line command by clicking the Line button in the Draw panel on the Ribbon or by typing Line (or L) and pressing Enter. Hold down the Shift key, right-click anywhere in the drawing area, and release the Shift key. The Object Snap menu appears. Choose an Object Snap mode, such as Endpoint, from the Object Snap menu. 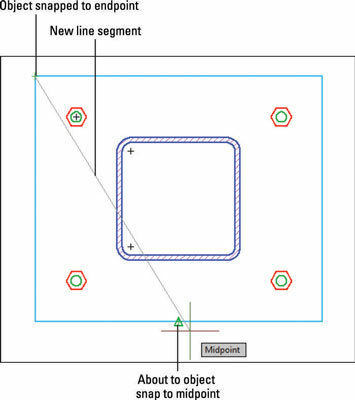 When you move the crosshairs near an object with an endpoint, a colored square icon appears at the endpoint, indicating that AutoCAD can snap to that point. If you stop moving the crosshairs for a moment, a tooltip displaying the Object Snap mode (for example, Endpoint) appears, to reinforce the idea. Click when the ENDpoint object snap square appears on the point you want to snap to. When you move the crosshairs around the drawing, AutoCAD no longer seeks out endpoints, because object snap overrides last for only a single pick. You can use the Object Snap right-click menu again to snap the other end of the new line segment to another point on an existing object. Display the Object Snap menu again (refer to Step 4). Then choose another Object Snap mode, such as MIDpoint, from the Object Snap menu. When you move the crosshairs near the midpoint of an object, a colored triangle appears at the snap point. Each object snap type (such as ENDpoint, MIDpoint, and INTersection) displays a different symbol. If you stop moving the crosshairs, the tooltip text reminds you of what the symbol means. Draw additional line segments by picking additional points. Use the Object Snap right-click menu to specify a single object snap type before you pick each point. Try the INTersection, PERpendicular, and NEArest object snaps. If the drawing contains arcs or circles, try Center and Quadrant. When you finish working with object snap overrides, right-click anywhere in the drawing area and choose Enter from the menu to end the Line command. You can activate object snap overrides by entering the first three letters of a mode at the command line. Right-click: Displays menu options for the current command (or common commands and settings when no command is active). Shift+right-click: Always displays the same Object Snap menu.